Yeasts are one of the earliest, if not the earliest, biological tools used by people. The earliest known written words in human history document recipes for making bread and beer, both of which are made using yeast, as well the price of bricks – it seems our fancy for food and drink while discussing the price of property has remained unchanged over the years. Brewers' yeast, Saccharomyces cerivisae, features widely in products we consume daily in our billions across the world, but these ancient unicellular fungi are poised to become a defining organism of the modern era. Yeast can be used in biorefineries to make biofuels for transport as well as platform chemicals for a variety of medical and industrial processes. Moreover, yeast are a key model organism in the emerging field of synthetic biology, and engineered or even reconstructed artificial strains may be manufacturing the fuels, food and pharmaceuticals of the future. "The stone age didn't end because we ran out of stone, and the oil age won't end because we run out of oil. We'll find better, more renewable and more environment friendly ways of making fuels, and yeast have a plethora of genes to do this," says Dr Ian Roberts, Curator of the National Collection of Yeast Cultures (NCYC), based at the Institute of Food Research, which receives strategic funding from BBSRC, and is based on Norwich Research Park. "What we're looking for is yeast as an enabling technology. The ultimate aim is that students of the future will program yeast genomes just as students today programme computer applications," says Roberts. The NCYC looks to the future – its part of the Synthetic Yeast 2.0 programme for example – but it also serves the present needs of industry: identifying, DNA sequencing and preserving more than 4000 pure reference samples worth millions to brewing and biotechnology companies around the world. This level of knowledge and the skills base for industry make it a BBSRC-funded National Capability and not just a facility. And the NCYC can even delve into the past by helping microbreweries to resurrect traditional ale recipes using old yeast strains stored for decades in liquid nitrogen. This meets the growing demand for 'nostalgia beers' and supporting Britain's multi-billion pound brewing industry as well as increasingly important areas of the rural economy. The yeast collection was first founded in 1948 when British brewers realised the value of their yeast cultures and put them in safe deposit to keep them secure. Roberts estimates there are a good 4-500 strains from beer brewers in the NCYCs present collection, including Saccharomyces carlsbergensis for example – the yeast from the original Carlsberg lager brewery. The NCYC then evolved into a broader collection and moved to IFR in 1981, collecting food spoilage yeast able to evade the conventional food preservatives. In 1999 the collection became a part of The United Kingdom National Culture Collection (UKNCC), which was established to co-ordinate the activities of Britain's national collections of microbial organisms – there are equivalents in the bacteria, algae and viral worlds. All of these collections are vital to the UK's bioeconomy, and in 2012 the NCYC became a BBSRC-funded National Capability, consolidating support for it to continue its core activities and expand into new projects. "The National Capability enables us to launch various products and services on the back of the capability we have, so in addition to providing services such as identification and safe deposit we can do a host of other research-oriented activities," says Roberts. These operations include identification and sequencing services using the advanced DNA sequencing techniques, which are available in-house as well as nearby at The Genome Analysis Centre (TGAC). "If a company has found an interesting new yeast species or has a problem with a particular contaminant, even if we can't tell you what it is we can tell you what it's most similar to using DNA sequencing methodology." The NCYC can also keep valuable strains in safe deposit (See 'Keeping, counting and transporting yeast'). For instance, as yeast are used they naturally evolve as they go about their business turning sugars into alcohol for example, and mutations creep into the fungi's DNA. These mutations could affect the metabolic processes that provide distinct flavours for certain brews, so the NCYC is on-hand to store a master reference version of that strain. This way, companies can safely deposit different strains in case of genetic drift, theft or accident. NCYC Collection Manager Chris Bond says the NCYC was on hand to send out an ampoule on the same day that a request was received from a flooded brewery. "We supplied yeast back to Marston's who were able to continue brewing on another site and eventually restock the original brewery." Bond can do this because the main bulk of the collection is preserved in liquid nitrogen at -196°C, which effectively puts the yeast into a kind of stasis. They can stay for decades in that state and be revived in just days for distribution around the world. Samples are sent freeze-dried in sterile glass ampoules, but they can also supply live cultures and are sent to China, the US, Australia and most of Europe. In addition to storage and other services, the NCYC also acts as an information hub. Advice is provided on the sugars metabolised by particular strains, as well as how to maintain a large collection of genetic resources and how to make them available to other research communities, from universities to major industrial brewers or biotech start-ups. "There are probably not that many countries that we don't supply to," says Roberts. "Yeasts are little packets of information and people need to know what applications are available in each genome, what sugars they ferment and so forth." Dr Steve James and yeast storage. The modern applications of yeast are in industrial biotechnology, and a key focus of the NCYC's activities is utilising yeast that can produce fuels and chemicals. 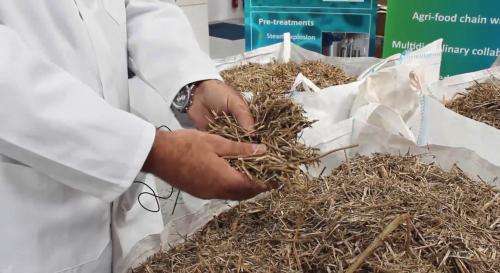 To do this, they feed different strains into an advanced experimental biorefinery located on-site at IFR, metabolising the sugars in agri-food waste substrates such as wheat straw and waste biomass into liquid transport biofuels. The researchers are keen to extend the range of substrates that yeast can use and make them more robust. This is because when wheat straw, for example, is broken up a lot of chemical inhibitors are released which slows the beneficial metabolic reactions. Roberts says that strains used in brewing cannot work in the more rigorous environment of highly variable biomass, so they're looking for different yeast strains, or using them in combination, that can overcome these inhibitors. They are also looking for yeasts that can metabolise material such as seaweed, which would not require the biomass to be grown on farming land. "Seaweed is one possible source, it's renewable and available," Roberts explains. "Farms have been established for conversion to bioethanol, and a yeast that can do that more efficiently could have a significant economic impact." Professor Keith Waldron, who is also based at IFR and leads the biorefinery research programme, says there is also an increasing focus on seeing what new chemicals yeast can yield from different substrates. "Our initial work focused on ethanol production, we're now working with the NCYC to explore the potential for the production of platform chemicals, making use of the biodiversity in the yeast collection." Yeasts are also at the forefront of efforts to create not just engineered organisms, but entirely new classes of microorganisms. In 2009 Craig Venter, a geneticist and pioneer of the Human Genome Project, revealed what he described as the world's first synthetic organism: his team transferred the genome of a bacterium into a yeast, modified it by altering methyl groups (which affect how DNA is used) and then transplanted into another bacterium. Then in 2011, a different team made yeast with partially 'artificial chromosomes' recreated using DNA sequencing. The introduced DNA contained a 'scrambling' element that could be switched on or off, and would lead to a greater number of mutant yeasts in order to search for ones better suited to making certain compounds and metabolites. 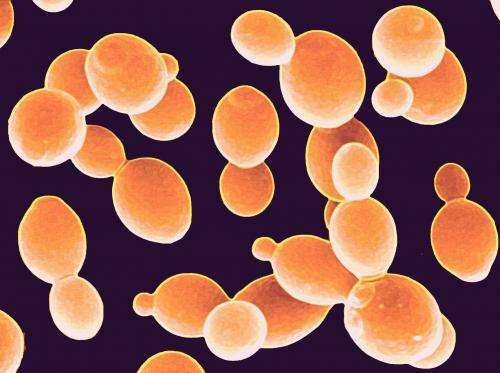 The Synthetic Yeast 2.0 programme, funded by BBSRC and EPSRC, now aims to build an entire yeast genome – the first time this has been attempted in a eukaryotic (non-bacterial) organism. "We're providing advice on managing and distributing synthetic yeast collections as part of its 'BBSRC National Capability' remit," says Roberts. "The NCYC team have also established an extensive network of industrial yeast users which they plan to build on to ensure that scientific advances associated with this topic are rapidly translated into economic impacts." Synthetic Yeast 2.0 is a major programme featuring collaborators from the UK, USA, China and India at universities around the world. Each team is responsible for building one of 16 individual yeast chromosomes that comprise the 6000 genes of the complete genome. Roberts says the NCYC is also closely linked with the 1002 Yeast Genomes project, co-lead by Dr Gianni Liti and colleagues at the Institute for Research on Cancer and Aging, Nice, which aims to sequence and assemble the entire genomes of 1002 S. cerivisae strains to link the physical attributes capabilities of yeast (phenotype) with their genetic sequences. "On this project we have the additional responsibility of helping to source, identify and select novel isolates to feed into the 1002 project," says Roberts. "We try to source from as many natural populations as possible and select on the basis of trait variation and fine-scale phylogenetic diversity." Yeasts have an integral part to play in solving the problems of the present and the future, but that does not mean that traditional uses have been forgotten. Tastes have changed – people are buying less of the continental lagers that were considered sophisticated in the 1980s. Instead, traditional ale sales in the UK have increased along with the establishment of small 'microbreweries' that produce fewer, often premium, products. As part of the movement, traditional ale enthusiasts have looked to the past to recreate old brews in what had been dubbed 'nostalgia brewing', and for that they need the yeast that were used at the time, which is where the NCYC can help. "Regenerating those ales is of growing interest," says Roberts. "We don't have ancient beers but we do have the yeast that were used to generate the ancient beers, and often the recipes are still available in the brewing industry. So to revive a traditional ale if they have the recipe and we have the yeast they can put the two together and create a beer appropriate for the market." And although ale-drinking conjures up images of rotund, red-faced fellows in country pubs with a dog and a shotgun at the ready, the modern reality is anything but – ales are the emerging drink of fashionistas from London to Lyme Regis. And the growth in ale drinking counters the trend in pub closures and an overall drop in alcohol intake per person in the UK. Taking into account that brewing in Britain is a multi-billion pound industry, this means the value of a national resource of brewing yeast alone is something to drink to. Dr Steve James, a yeast molecular taxonomist based at the NCYC, explains his role and interest in yeast biodiversity, as well as how they are stored and sent around the world. "My particular interest is in yeast biodiversity from various habitats, and in expanding the general diversity in the collection to use academically and industrially. So far the total number of yeast species discovered is around 1500, and a conservative estimate is that there are 10 to 100 times more to be found. And literally it's just a matter of going into habitats that have not yet been looked at. We've got ongoing collaborations with colleagues in Ecuador taking students into cloud and rainforest environments, which haven't been looked at before from a yeast perspective. We've already identified three or four new species and this is just touching the bottom of the cloud forest. People are familiar with brewers' and bakers' yeast, but not many people know that you find yeast across the globe, from the Antarctic to the Arctic, in the land, air and sea, even at serious depth. In recent years, yeast have been found in these deep water hydrothermal vent environments on the sea floor, so they have enormous academic as well as industry interest. When we receive species that might be new we look at specific DNA sequences in the database for all known 1500 species for comparison, and if there are no matches to existing sequences it flags a new species. We then take it on to look at its biological properties to see what it ferments, what it grows on to get a better idea of the yeast as a whole. Long term we're looking to link phenotype [physical characteristics] to genotype [DNA sequence] and for the 1002 Yeast Genomes project one of our key roles is to confirm the species identity (as S. cerevisiae) of individual yeast strains selected for genome sequencing. In terms of the things yeast can do it's probably comparable to bacteria; all sorts of processes, from clinical interest to research with yeast as a model organism. A lot of the genome is comparable between humans and yeast, so it can be used from a biomedical perspective as well. Here we have a steam explosion unit which breaks up agri-food material and releases the sugars and that's what the yeast turn to alcohol and other compounds. You can use a number of different yeast species to metabolise xylose, for example, as well as sucrose and fructose, and use them both alone and in combination. With the yeast collection at the Institute of Food Research, the University of East Anglia and the plant- and microbe-focused John Innes Centre also on the Norwich Research Park, there's a lot of science on site so it's an exciting time to bring all this work together."